KAD’s spirally round ducting is manufactured from Z-275/G90 galvanized steel coil, complying with DW144 and SMACNA low, medium and high pressure system. KAD’s spirally round ducting has a smooth interior for low friction losses with the grooved seam entirely on the outside. Available from 100 mm to 1500 mm with standard length of 3 meter, along with the entire range of fittings. 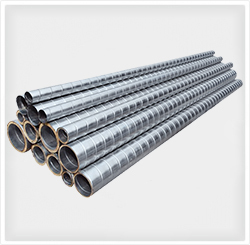 Available in uninsulated or pre-insulated as per requirement. Fast easy manufacturing and installation. Aesthetically better looking than conventional rectangular duct. Low air leakage as gasket are pre-mounted on the duct in factory. Available in different RAL colours.